We know how important eye care is at Taylor’s opticians, and we always endeavour to offer you the best quality service and innovative products. Our dedicated team will always give you a warm welcome. We have teamed up with Hoya lenses to offer all of our patients the opportunity to receive a second pair of spectacle lenses at half price. 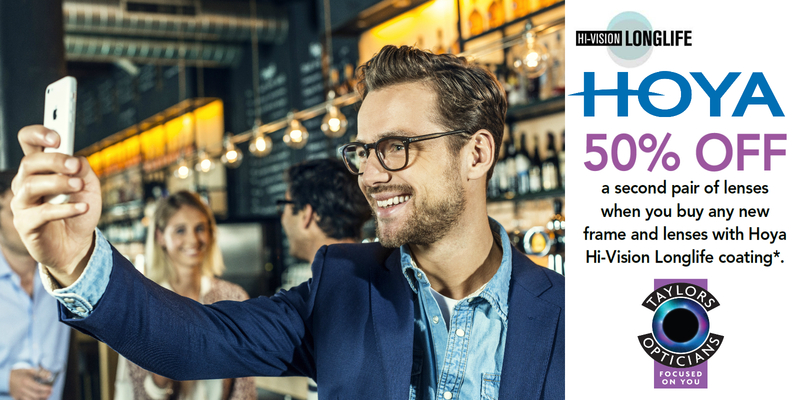 To benefit from our 50% OFFER all you need to do is purchase a new pair of spectacles with Hoya Hi-Vision LongLife coating, purchase a second frame, then you will receive 50% off your second pair of spectacles lenses. (Your second pair of lenses must be to the same lens design and prescription as your first pair). But hurry as this offer ends very soon. Hoya Hi-Vision LongLife is an innovative and exceptionally durable anti-reflection coating which confirms Hoya’s leading position in spectacle lenses. Hi-Vision LongLife is one of the hardest anti-reflection coatings available on the market today. A unique total composition with a strong adhesion between the various layers ensures years of excellent performance and durability.